Combat in the game is quick and deadly. Units roll a number of dice for their attacks based on the number of ranks left in their unit, with each attack having a different target number needed in order to Hit. When Hit, defenders need to roll equal to or above their Defense stat to avoid losing figures. While certain units like Cavalry might have multiple wounds per figure, most troops only take a single hit to be removed. It’s not only swords and arrows that can drain an enemy’s fighting ability. The rigors of battle mentally take their toll. After being attacked, a unit must make a Morale Test to see if anyone in has lost their resolve, causing them to run off from the fight if they don’t pass the test. The A Song of Ice and Fire: Tabletop Miniatures Game includes five different game modes. Each one has unique instructions for how the board is set up, the win conditions, and various types of special rules. A Game of Thrones forces players to maneuver around the board and their opponent, looking to hold vital areas of terrain. A Clash of Kings sees them building up their forces as they fight in an escalating engagement. A Storm of Swords pits the opponents against each other in a mighty castle siege. A Feast For Crows is an attrition battle, as both sides are haggard and tired from long days of fighting. Finally, The Winds of Winter gives players secret objectives that they must accomplish without the knowledge of their opponent. The Stark vs. Lannister Starter Set has everything that two players need to build their own forces for these two great Houses. It allows players to get the complete experience of the game, with each House getting four full units of troops, along with various NCUs and multiple options for army Commander. House Stark takes to the field with two units of Stark Sworn Swords, a unit of Umber Berserkers, as well as the mounted Stark Outriders. House Lannister counters with two units of Lannister Guardsmen, and a unit each of Lannister Halberdiers and The Mountain’s Men. The options for these units include different Attachments that can be added, letting players tailor-make their army to their liking. Many important characters from the book series also are part of the box, such as Robb Stark, Greatjon Umber, Ser Gregor Clegane, and Cersei and Jaime Lannister. The models in the game are all-new designs from CMON, under license from Dark Sword Miniatures. They are pre-assembled in plastic, with weapons made with ABS, making them resistant to bending. Each unit also has its own Stat card. The set also includes all the tokens players will need to mark game effects, as well as dice, measuring sticks, and even terrain templates. It truly is an all-inclusive starter set, letting players open it up and begin using their figures immediately on the field. They are able to engage in any of the game’s five different game modes at a standard-sized game level. No further purchases are required to dive right into world of Westeros. There is plenty for an army, complete with extra options to tailor forces to a player’s preferred tactical style. The set includes firm foundations upon which forces for either of these great Houses can build upon. Later purchases can allow players to further refine their army to their liking, and give them more tactical options. The Stark vs. Lannister Starter Set for A Song of Ice and Fire: Tabletop Miniatures Game, is the perfect way for new commanders to sink their teeth into the rich and vibrant world of the George R. R. Martin book series and write a new chapter to the War of the Five Kings. 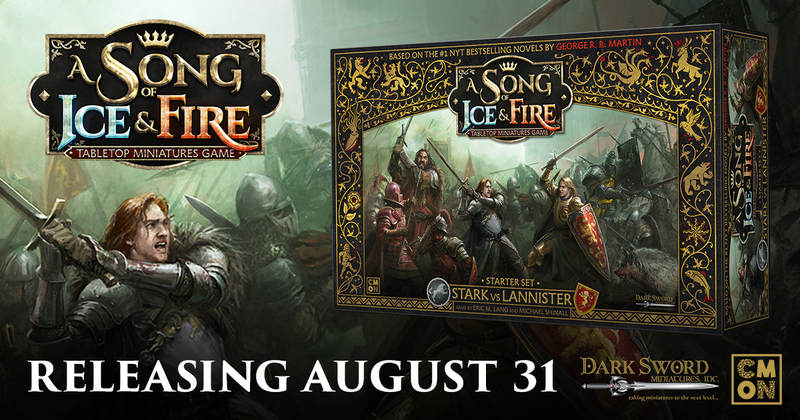 The Stark vs. Lannister Starter Set will be hitting store shelves on August 31.